This page introduces the idea of developing a Volunteer Leaders Dashboard. This is a tool to provide focus on priorities and simplify communications with key customers. What is a Dashboard: Think about the dashboard on your car. It tells you your speed and the condition of your car, e.g. high beams are on or there is an engine problem. 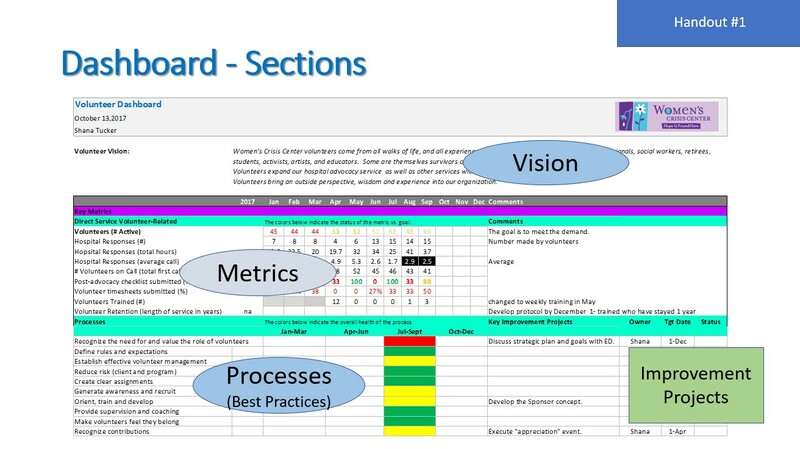 Similarly, a Volunteer Leaders Dashboard tells you if you are moving toward your Vision and goals. It fits with your organizations Vision and Goals. Include mandated metrics – those that UW and your Board care about. Include everything that is important to success in your role. Here is the framework we are using to create dashboards in NKY. Contact us if you want to develop one and need support.